January 8, 2019  "We started out as romantic partners at the beginning of the album and then we weren't anymore by the end," musician Kalmia Traver says. 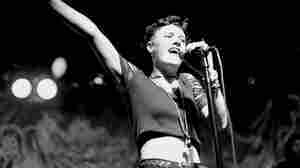 July 17, 2017  In this video from Alexander F — the side-project of Rubblebucket's Alex Toth — a punk singer transforms into a ballerina in a Kafka-referencing piece of individualistic affirmation. July 13, 2017  There's comfort and mystery in "Bodyriders," the newest song from Kalbells, the solo project of Rubblebucket singer and saxophonist Kalmia Traver. 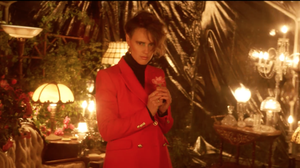 April 11, 2017  The big wailing band of fun known as Rubblebucket are captured by a gender ambiguous fashion witch in this video for their song "If U C My Enemies"
February 14, 2017  Hear bandleaders and partners Kalmia Traver and Alex Toth discuss why making the new EP If U C My Enemies was so significant for them. November 16, 2016  When profound change happens in life, the meaning of the music you hear tends to change, too. On this week's show: Songs both light and dark in a post-election world. February 3, 2015  Watch part of the Boston band's boisterous and engaging hometown set last fall. January 20, 2015  Even without its confetti cannon, the band brings a fun mix of brass and brash to the NPR offices. 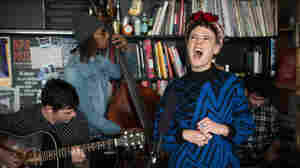 October 8, 2013  The Brooklyn-based band Rubblebucket delivers a colorful blast of funk and horns in this fabulous lyric video.